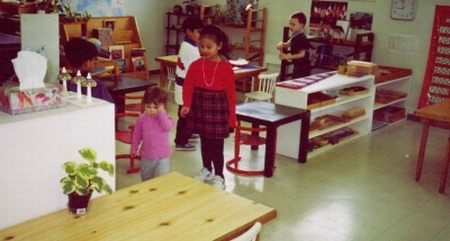 The Montessori environment is one in which a child has the freedom to work with materials of their personal choosing. Educational materials are provided for the children to work with but these materials are not meant to be carelessly played with. These materials must be used in a respectful and educational way. Part of our Preschool Prep Program is to have the parent and child come together, outside of regular operations, with the parent guiding the gradual development of their child's self soothing - self regulating methods. This is mentored under the personal guidance of our Director & staff in a small group setting. Intimate, personalize and gentle to support establishing the framework for loving life long learning. The Montessori Method is focused on the child and their capacities and children are allowed to choose what materials they work with and work at their own pace. Although the role of the director is not to coddle the child, they will provide a child with the correct amount of individual direction that they need to succeed and learn. This direction is gentle, and observation based using open ended questions or cues that support the empowerment of the child. Montessori students are given many safe appropriate opportunities for inquiry, exploration and freedom gradually within a carefully prepared environment. The children are not permitted to run around carelessly and they are only given as much freedom as they can handle. This amount of freedom allows them to follow their needs and work within their interests, which encourages a healthy self concept including unending confidence! The children in the preschool age group do not really distinguish between work and play - their work in the classroom is considered play to them because they are enjoying themselves. These children are learning through their interactions with other students and the equipment and they are having fun! At the preschool level, children often crave independence and will frequently enjoy working on their own. The Montessori Method does not intend for the children to isolate themselves. Depending on the policies of the school and the teacher, children are allowed to work in groups as along as work is still getting done and the children are not being disruptive. Any facility and director that is truly adhering to the basics of Montessori Methods would never push a child towards something. Children of the preschool age are ready to begin reading, writing, and doing mathematics with concrete materials. Children are interested in these materials and are naturally curious and become ready and willing to learn these concepts. There are many misconceptions about the Practical Life portion of the curriculum. It should be made clear that children participate in these activities because they want to. Any parent knows from experience that children love to imitate and often wish to participate in household chores with their parents and the Montessori Method gives them a chance to.